Amazon is building a new version of its artificially intelligent Echo speaker with a screen, according to a Bloomberg report. The device is currently being worked on by the company’s secretive Lab126 research team that was also responsible for some of Amazon’s greatest flops and successes like the Fire Phone, Echo Dot, and Fire tablet. It sounds weird and kind of unweildy—but it might prove to be a great idea. The next-generation Echo will reportedly have a seven-inch touchscreen attached to the top of the speaker. It’s worth noting the size of the screen is almost identical to the size of the company’s existing Kindle Fire tablets. From the limited details that have been shared, it sounds like Amazon engineers have created a Frankenstein product using parts from Kindle tablets and Echo parts. It’s going to look freaky, and there’s a good chance that it could fail—but it’s really no different than the other experimental hardware built by Amazon’s Lab126 research team in the past. Including a touchscreen on an Echo sounds especially weird because it won’t be portable, so it’s not like you can drag it around the house and watch TV. 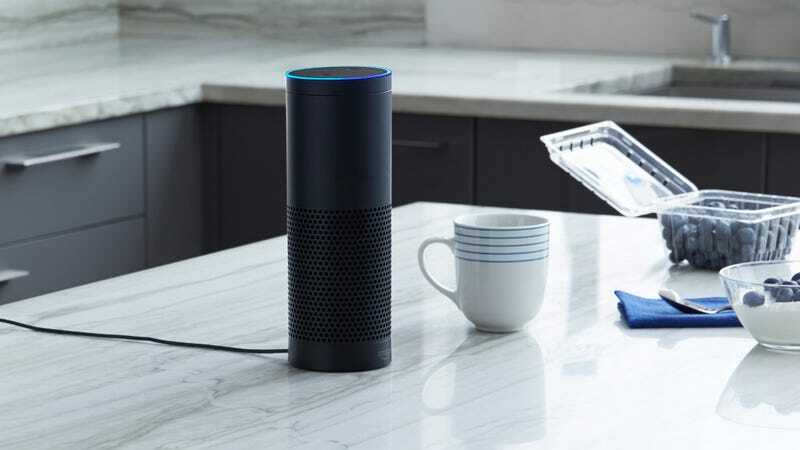 Instead, the new Echo will be made for use on counter-tops, like in the kitchen, where you can tilt the screen up and watch videos while you’re cooking. According to the report the screen will also serve up useful information at a glance like weather forecasts, calendar appointments, and the daily news. For anyone that’s ever used an Echo, at-a-glance information will actually come as a huge relief. As much as I love my current Echo, I basically only use it for three things: news, weather, and calendar. It’s a pain asking the speaker for each of those updates every morning. If I could get that information by just looking at a screen, that might help me get ready faster in the morning. The new Echo will also supposedly come with a much-needed speaker upgrade. The screen will reportedly be attached to the top of the Echo and tilt updwards, making it easier for people to hover over the tablet and glance at the screen while they’re getting things done. We won’t have to wait much longer to see this bizarre product, either. According to the report, the new speaker goes on sale in the first quarter of 2017. What’s now clear is that Amazon is serious about figuring out the contours of its home assistant market. Amazon also put Alexa, its artificially intelligent assistant, into its tablets earlier this year. Amazon executives have openly admitted they were surprised by the demand from developers and customers, and now it’s clear the company trying to capitalize on the unexpected success. Amazon has reportedly sold 5 million units since 2014. The only downside for Amazon is that more major technology companies are entering the marketplace to take on Echo. Google released its own Google Home intelligence speaker earlier this year, and there have already been murmurs that Apple is working on building a home device using its digital assistant Siri. It’s hard to say how all of this might shake out when most of the voice-activated speakers are just a year or two old, and when companies are still messing around with their designs. What can easily be said, however, is that strong speakers and easier controls are a welcome change to the Amazon Echo. The current version sounds like a tin can speaker, and it’d be nice to get basic information about the day without having to ask.